Let Shuja Nawaz take you into The Inner World, a poetic travelogue enriched by a lifetime of discovery across the globe, and introduce you to the people and places that inform this delightfully rich trove of imagery and wordplay. A fitting follow-up to his earlier highly treasured Journeys, this volume will entice and enthrall you.Shuja Nawaz takes you behind the scenes of his own life as a world-renowned strategic and security analyst and advisor of civil and military leaders in the United States, Europe, and South Asia. These poems will surprise and excite you. Based on 30 years of research and analysis, this definitive book is a profound, multi-layered, and historical analysis of the nature and role of the Pakistan army in the country’s polity as well as its turbulent relationship with the United States. Shuja Nawaz examines the army and Pakistan in both peace and war. Using many hitherto unpublished materials from the archives of the United States, the United Kingdom, and the General Headquarters of the Pakistan Army, as well as interviews with key military and political figures in Pakistan and the United States, he sheds light not only on the Pakistan Army and its US connections but also on Pakistan as a key Muslim country in one of the world’s toughest neighbourhoods. In doing so, he lays bare key facts about Pakistan’s numerous wars with India and its many rounds of political musical chairs, as well as the Kargil conflict of 1999. He then draws lessons from this history that may help Pakistan end its wars within and create a stabler political entity. Forthcoming April 2008, Oxford University Press (Pakistan) and May 2008 OUP, USA. Updated 2nd edition 2017. To order from OUP USA please visit here. “Running at more than 600 pages, this densely researched study of Pakistan’s army – the country’s premier political institution – is set to become a standard reference. Based on a wealth of primary documentary sources and privileged access to key players, both domestic and foreign, it lays bare the less-than-benign role of a power broker that has dominated Pakistan’s national politics and that could yet determine its future course”. Increased militancy and violence in the border region between Afghanistan and Pakistan known as the Federally Administered Tribal Areas of Pakistan has brought FATA into sharper focus, as U.S., Afghan, and Pakistani leaders attempt to find solutions to the problems underlying the situation there. This most dangerous spot on the map may well be the source of another 9/11 type of attack on the Western world or its surrogates in the region. Should such an attack occur, it likely will be spawned in the militancy that grips FATA and contiguous areas in Afghanistan and Pakistan today. The principal actors are the Taliban, in both countries; their allies—former Soviet-era mujahideen commanders including Gulbadin Hekmatyar of the Hezbe Islami and the Haqqani group (headed by Jalaluddin and his son Siraj); Sunni militants from Central and Southern Punjab; and al Qaeda, which benefits from links to most of these insurgents. The Taliban leader Mullah Omar is suspected to be hiding in southwestern Afghanistan and Pakistani Balochistan. The Taliban are engaged in a struggle against foreign forces inside Afghanistan and now against the military in Pakistan. Hekmatyar has spoken against the Pakistani government but has not yet taken up arms against it. The Haqqanis have also not provoked a battle with the Pakistani forces as yet. The Punjabi militants, however, have become franchisees of al Qaeda and have been linked to attacks on the Pakistani state and its army. While many ideas have been put forward for tackling the issues facing FATA, too often they rely on longer-term plans and solutions. 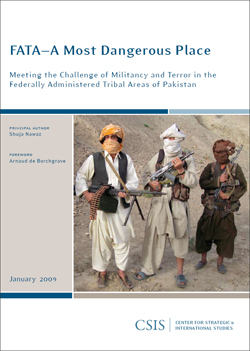 This report attempts to define the conditions that spawn militancy and violence among the Pakhtun tribesmen that inhabit FATA and suggest practicable ways of approaching them in the short and medium term. Concrete actions by the principal actors—the U.S., Afghan and Pakistan governments and the U.S. and Pakistan militaries—are suggested. These will need to be underpinned by a national debate in Pakistan, in particular, on the nature of the country’s polity and the need to tackle terrorism and militancy as domestic issues. But the debate will need to be rooted in a clear consensus among the civil and military leadership on the nature of the Pakistani state and society and how to tackle the growing militancy inside the country and in broad-based support from major political parties and the general public. The United States needs to forge a longer-term relationship with Pakistan and its people, shifting from a transactional relationship to one built on strategic considerations and respect for Pakistan’s political and development needs. Failure to bring peace and to restore a modicum of stability to FATA will have widespread repercussions for the region and perhaps the world. This report by a team sponsored by the Center for Strategic and International Studies of Washington DC was released on January 7, 2008. The principal author is Shuja Nawaz. 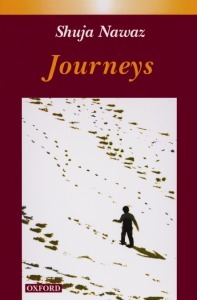 Journeys is Shuja Nawaz’s travelogue that traces a complex of journeys across the globe. But wherever he goes, the pull of memory draws him towards Pakistan. He captures the sounds and the sights of his homeland while viewing foreign lands through the lens of a native Punjabi. He attempts to revisit and revive many of the rhythms and rhymes of Punjabi poetry in English verse, using his experience with translations, including that of the Potohari verse of the late Baqi Siddiqui of Rawalpindi. This book of verse is a celebration of Shuja Nawaz’s deep and strong emotional links with the land of his birth. Published by Oxford University Press 1998. Out of Print.